Hoarding can present many health risks and can be very dangerous to clean up. Call on the experts here at ServiceMaster by Gadonniex to handle the hoarding situation for your family or someone you care for. Our technicians are experienced in cleaning and restoring property to sanitary and healthy conditions. Hoarding creates the perfect environment for mold and other types of infestations to grow. Water damage and mold can quickly spread throughout hoarding situations if left unchecked. This can put the residents or occupants at risk. We have the specialized equipment and techniques in order to safely and effectively clean hoarding. 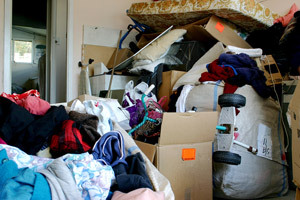 ServiceMaster by Gadonniex understands that dealing with a hoarder is stressful, difficult, and emotional. Our goal is to help you overcome the logistics of cleaning and restoring your family’s property. Our dedication is to help you clean and sanitize the contaminated area with expert and professional service. Our technicians are specially trained and are standing by to clean up any job including the worst types of garbage and biohazard waste. We will determine what is salvageable and will work with you to restore your belongings. Call ServiceMaster by Gadonniex for professionals that have the powerful equipment necessary to clean, sanitize, and restore your home. Call ServiceMaster by Gadonniex for expert hoarding cleanup services!